Twenty-year-old Tanzanian Striker Ismail Mrisho Khalfan, is dead. 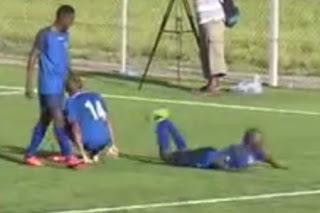 The Mbao FC player died in Tanzania after he was tackled by another player. Minutes earlier, he scored a wonder goal that sealed victory for his team. It was the last match in the group stage of the ‘Ligi ya Vijana’ competition in the town of Bukoba in the Kagera region of north-western Tanzania. Widespread reports in Tanzania said there was no resuscitation equipment in the ambulance that transported him to the hospital, with paramedics having to use heart massage techniques in a bid to save his life. Announcing his death, Tanzania Football Federation said: "We have received with deep sorrow the news about the death of the player and we send our condolences to the parents, family and teammates."